Quality and accuracy plus a good number of labels add up to value. I did not have to wait long for my order. I am pleased and would order from Miles Kimball again. It's easy, peel & stick. I love using these. I've been ordering these for YEARS! Always a good product, with timely shipping. 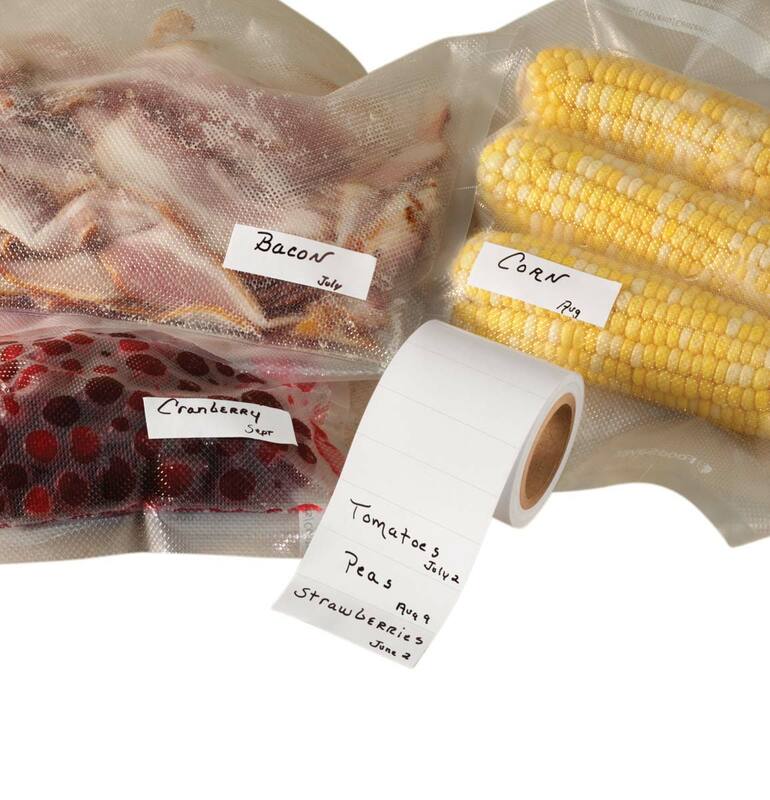 Easy peel and stays affixed. I use this product for identifying pictures.....great value ~~ great price! My husband would often ask me to address mail for his small business when I was already busy with something else. I got these address labels for him.They are perfect; He loves them, and so do I. Professional looking. Easy to peel and adhere. I would not hesitate to recommend to anyone. I have referred all my business associates here for their label need. I attached the labels to different colored books and they show up nicely. 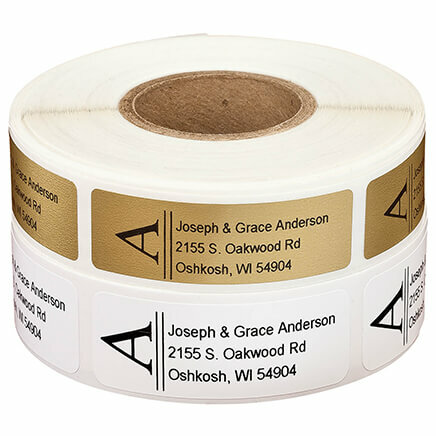 These return address labels stand out in the gold color. I use these labels on all mail that is from both of us (self and spouse). They stick quite well, and I like that the color works on all colors of envelopes. We use the labels for personal & business use. We have been using these for years! I use it to send outgoing mail, and they are good. Exactly what we wanted and so easy to order. I and my 15 member team all use for our correspondence to our clients at church. They handy, clear, and give our correspondence a professional appearance. I will be adding my printed lables onto my sample products that I hand out. Just right, great price and delivered quickly. Miles Kimball: The standard for labels. Miles Kimball is the standard bearer for address labels; always has been, always will be. I'm so happy I can rely on this company for accuracy and quality when ordering labels. Once you've tried Miles, there are no other styles! I have ordered labels previously. We needed them since we have just moved. I'm a Independent Distributor and use the labels on business literature. The labels are very durable and maintain adhevsive even after several peels. Very good quality and good price! After opening, you will have to find something to keep them from coming off of the roll..a rubber band or something. My husband has his own return address stickers--and now I have my own! I'm tired of writing out name & addresses by hand! I use my labels primarily for samples. The size is perfect and it's readable. The paper material used was awesome. For an inexpensive price, the quality is great! 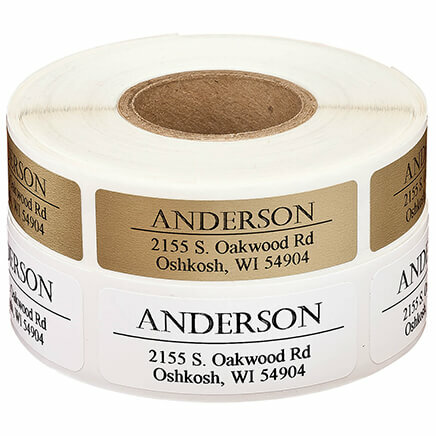 I'll order my next roll of labels again, and more! I hate when I run out of the labels, so I am thankful for Miles Kimball for making it easy to buy them. Came exactly as ordered. The print might be a tad smaller than expected, but printing is clear and correct. Great value for the price. Sending out Christmas cards. Easy to use. Works great although comes out backward, they are wound in wrong direction. 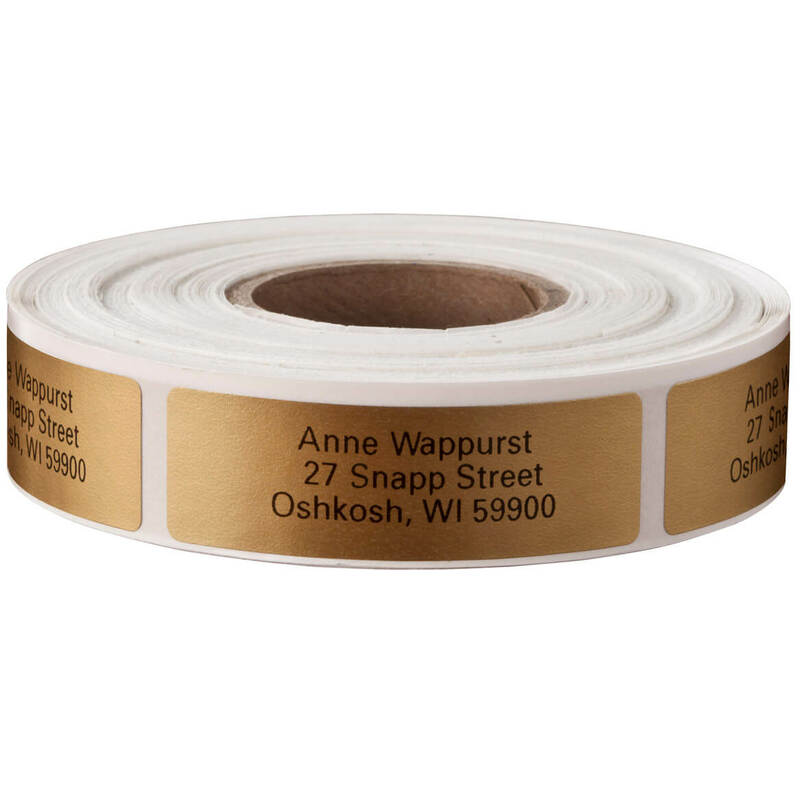 This is about the best value for address labels on the market. They are clearly printed on quality plastic, they have a good adhesive, yet peel easily from the backing. treat yourself and get a dispenser. May never need to buy labels again. I have used these before and love them. Saves time writing your return address. Have always ordered address labels from Miles Kimball, however, the print on these labels was much lighter than previous ones. Concerned about them eventually fading. Great value, good size - not too small or large. Great adhesive. Have a dispenser to go with labels? Quality excellent; however, it doesn't fit my dispenser. I was very disappointed with the quality of the imprint on these labels. I ordered 5 rolls of them with black imprint. The black is not very dark and the imprint was not centered top to bottom. The last line is almost off of the label. Also on one of the boxes the 2nd line has gaps in the black lettering. Will not order these again. If they had my name on the labels, I would have kept them and used them, Instead, I returned them. The labels that I received were not as advertised. Miles Kimball changed the software a year ago but have not updated the pictures. Label print is faded and smaller. I've been using these for years. Very good product. Not going to change. I use these labels in my business for the back of my books. When people have my contact info on the back of a book they can reorder or get the next book in a series. Been buying from Miles Kimball forever. 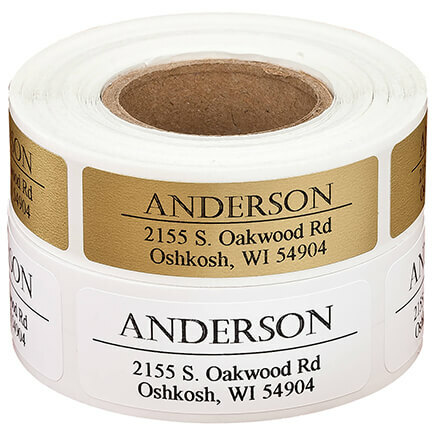 Have ordered address labels from MK for years...another great value (and always right). Have used these for years and am satisfied with quality and price. 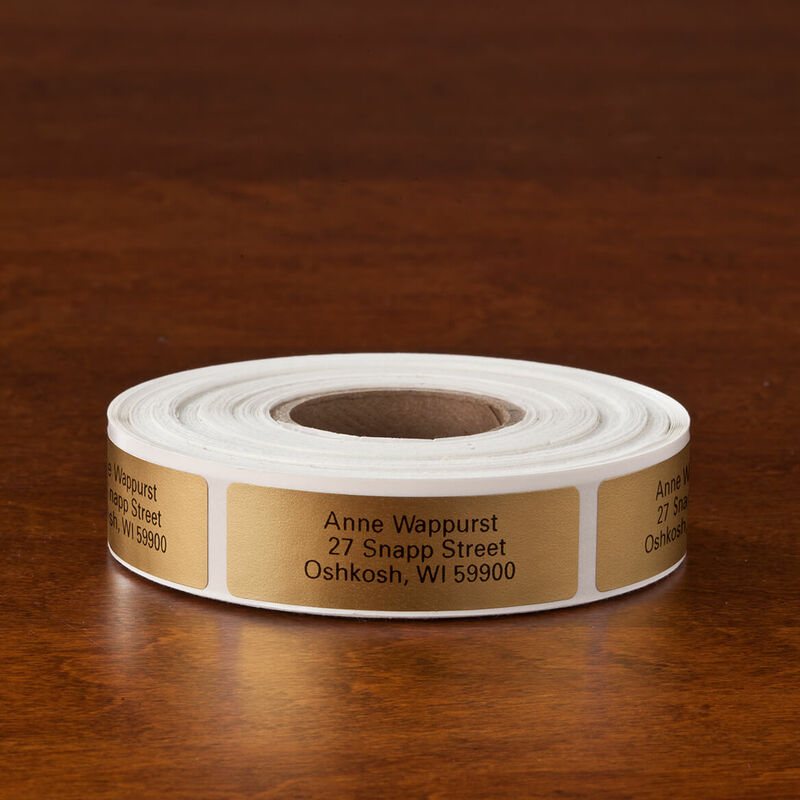 Not all address labels will accommodate 5 lines of text. I have used this item before and was very happy with it. We use these labels for some of our packaging. Great labels, used these from Miles Kimball before, need more soon. I've used these labels for decades. They're attractive, useful and inexpensive. Loved them in the past! Reorder. this is exactly what was needed. simple. They are clear and easy to use. Like the gold foil to match our New Year's Cards and the font. needed 4 lines and for invitations for a wedding. The address labels are a basic size that look good on any size envelope. I chose this style because I wanted a plain label. We used this service before. This is not on my current order. I have always used these self stick address labels and they work! Very economical and easy to use. Thank you! 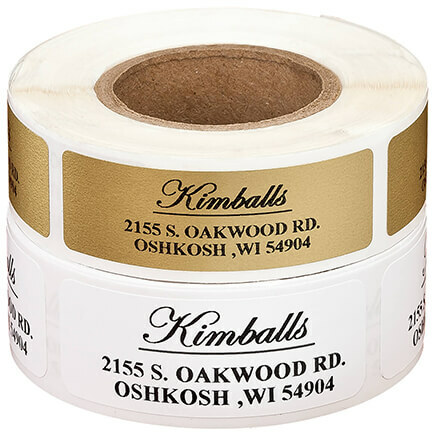 Miles Kimball offers extra lines on address labels. I've ordered from you for years. I brought these in the past , in both silver and white . I'm re- ordering because we moved to a new address . I like how easy they are for bills and Christmas cards . I'm old school , I still pay my bills by checks . I've been using these labels for 17 yrs! Love that three colors are offered, the size is just right and especially the options for five lines for all the info that I wanted to include. My website is long enough that it had to be split into two lines. Love these labels. Have used them for years! have used this product in the past,,,pleased with it. Easy to use and they have both a nice professional and personal look to them. I needed address labels that didn't have any design on them. I had a hard time finding some. Until I looked on your website. Have used these return address stickers before and had been more than satisfied! I need them for mailings and I.D. Good prices on your items. Have a variety to choose from too. I wanted a label 1 3/4" x 5/8" on a roll. Your size was the closest I could find. Simple, clear and reasonably priced. 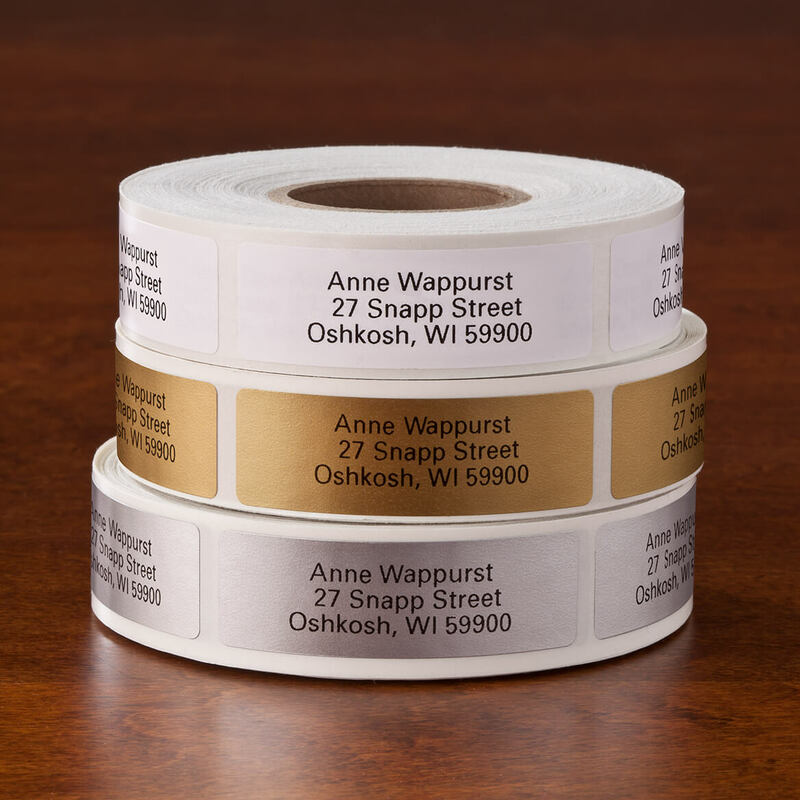 Where do I show name and address to be on labels? BEST ANSWER: Thank you for your question. There is a box that says select; if you click on it, it will drop down and ask if you want the item plain or with personalization, click personalization and you will then be taken to the personalization fields at the bottom of the website. We hope this information will be of help to you. BEST ANSWER: I have not run any envelopes under water so I can't say for sure that these are waterproof, however, I can say that I, myself, and my company have been using these labels, successfully, for several years. I would give them a "10" for durability and visibility. Though I gave these as a gift, I recall that the print does not smear. The product is paper based, so it really is not waterproof if soaked. So I guess it depends on what you mean by waterproof. They wouldn't smear but no more then any other label, soak them long enough they would prob come off. No. They may be water resistant, but not waterproof. Are these gold foil (shiny) labels? Hard to tell form picture and description. BEST ANSWER: Yes, they are a little glossy. Been buying these for years, usually silver, always pleased with product. Yes they really are gold and they are great!! I love them!! Yes they are gold and I like be them!! Do the address labels, come with a dispenser? BEST ANSWER: They don't ...they come in a square box. I've been ordering these stickers for years and they are great. I believe you can order a dispenser or keep your eye out for something cute. I just use the box. Thank you for your question. The labels come in a box that can be used as a dispenser. We hope this information will be of help to you. BEST ANSWER: Thank you for your question. The font is a 10pt.We hope this information will be of help to you. On another label I had 5 lines and it was 10. The font is a nice size. Very readable. I would recommend. BEST ANSWER: Thank you for your question. The font can not be changed on labels. The font only comes in the style shown in the picture. We hope this information will be of help to you. 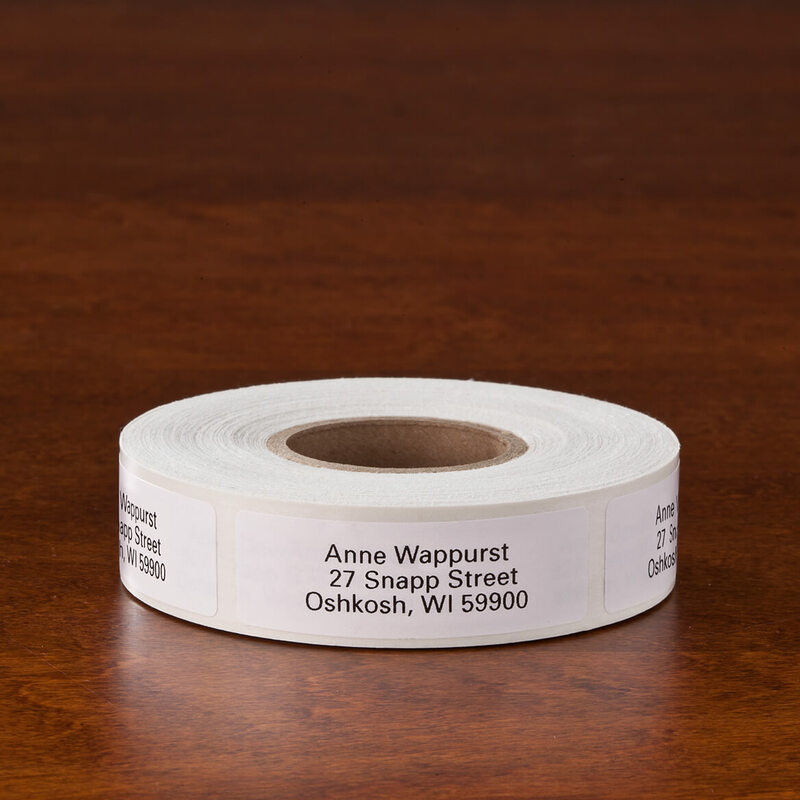 Is there a round dispenser for a roll of address labels available? BEST ANSWER: Thank you for your question. We do not sell a dispenser separately, the box is the dispenser. We hope this information will be of help to you. 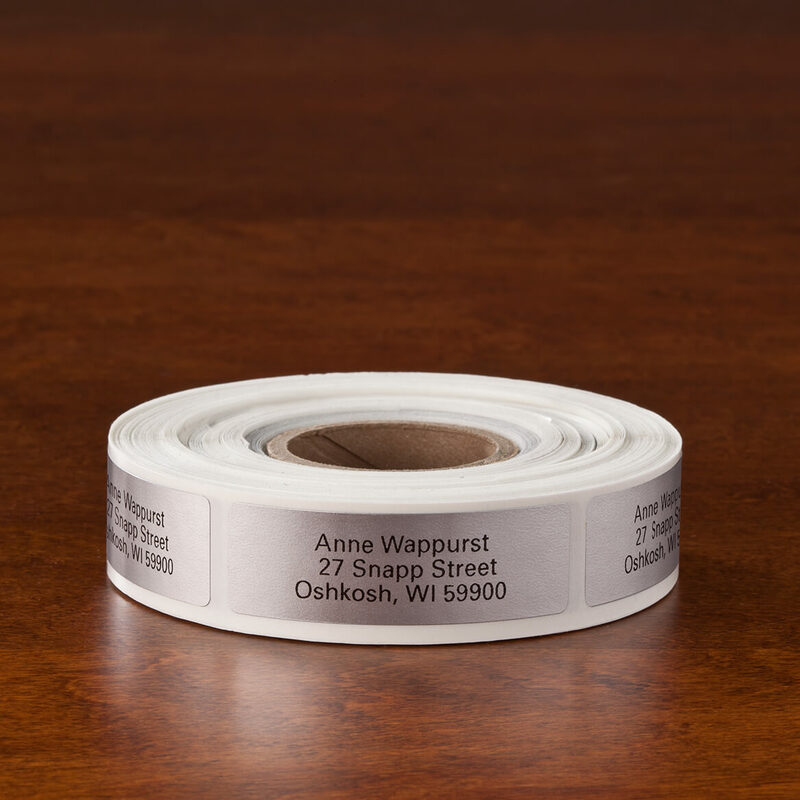 Do you have 4-line address labels? BEST ANSWER: Thank you for your question. Yes, this label actually allows up to five lines of personalization. We hope this information will be of help to you. How do I get a label that will allow 28 spaces on the first line? BEST ANSWER: Thank you for your question. We do not carry a label that will fit 28 characters per line. 25 is the highest. We hope this information will be of help to you.